Cougars, sometimes referred to as “mountain lions”, are the only wild cat of anything like their size and power commonly found in many parts of the USA. As such, they have a particular status in a variety of myths and legends of the indigenous American peoples; the Inca in particular were interested in the felines, and are said to have built the city of Cusco in their shape as well as worshipping a god, Viracocha, who is often associated with them. 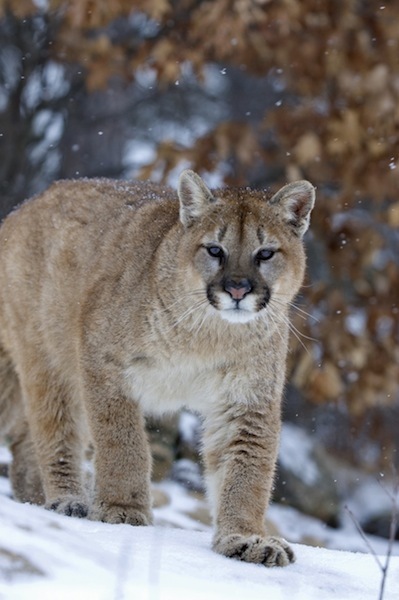 Many Native American societies had or have cougar-related associations, too; the Cheyenne, Cherokee, Apache, and Walapai have all had varied myths associate with the cats. The cougar has been everything from a harbinger of death to a sacred animal, and its properties are embedded deep within the roots of America. Fatal attacks on humans are rare, but they do occur – particularly as human encroach deeper and deeper into the cougar’s traditional territory. By and large, however, cougars prefer to avoid humans and stick to their own patches – just so long as they are not unduly disturbed. This is becoming increasingly more difficult, but the cougar’s most recent classification is still one of “least concern”. Their populations do, however, seem to be in decline. Cougars are slender, agile and fierce. There is nothing ‘cute’ about a cougar; they’re large, fast, adaptable animals, with large claws and powerful teeth. Their paws are large and at the end of long, lithe limbs, lending them a remarkable speed over short distances. They’re also skilled at leaping and jumping – and they can swim, although they choose not to unless they have no other option. They’re not amazing climbers of trees, but they’re good at scaling rocks and mountains with their broad paw pads. Their coat is always plan, and typically of a tawny colour – though there have been incidences of grey or red cougars. The young are slightly differently marked, however. Cougars are born spotted, and their coats fade to pale over time before finally darkening into their adult colours after the first year of their life. This is thought to be an aid to camouflage – while adult cougars need to blend in with the rocks and desert around them, infants are likely to be hidden in dappled shadows in crevices and underbrush. The cougar has a wider distribution than any other animal in the Americas, and can be found everywhere from the north of Yukon to the southern Andes. They can live in forests, on lowland, amongst mountainous deserts. They prefer dense underbrush, but they’re perfectly capable of living with little vegetation – they’re very well-adapted to living amongst canyons, escarpments and rim rocks. They’re perfectly attuned to all the various modes of American wilderness, and they can love almost anywhere in it. 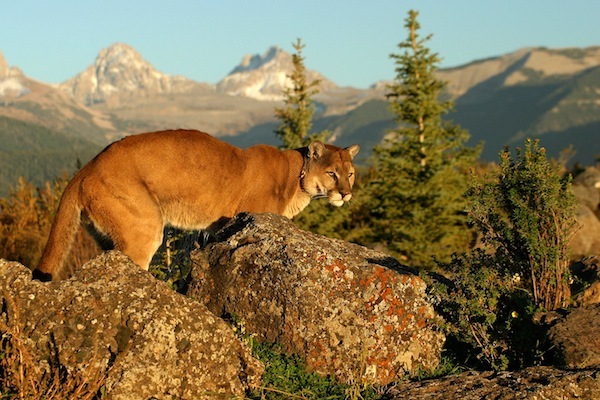 Cougars remain in Alberta, British Colombia, Connecticut, Florida, Illinois, Indiana, Iowa, Michigan, New Hampshire, Oregon, Quebec, Saskatchewan, South Dakota, Wisconsin and Yukon – as well as in every single Central and South American country. Cougars are, undoubtedly, fierce. They hiss, growl and scream, they’re as large as a human, and they can leap great distances to rip their prey to shreds. There is little about a cougar that can be tamed, domesticated or rendered safe. They’re not friendly or docile; they can’t be enticed into games or befriended by people. They are apex predators, and they are very adapted to maintaining that status against all the odds. They communicate very little, at least vocally. While mother and cubs might use vocal communication, older cougars almost never do – preferring to rely on body language, scent marking, and simple avoidance. They live alone, keep themselves to themselves, behave secretively and hunt only under cover of darkness. They display some activity around the hours of dawn and dusk, but it’s rare to encounter a cougar in broad daylight – they generally spend these hours sleeping and resting in small, hidden places. Male cougars are particularly vicious, particularly as they have more to fight for – they mate with more than one female, defend large territories that often overlap with those of females, need to hunt, kill and eat more often than females, and do not have the female preoccupation of raising cubs. As such they come into opposition often, and will sometimes fight to the death over a particular prey animal, female cougar or path of land. Cougars are ambush predators. They spy their prey – which will be any animal they can catch, from the smallest insects to the largest thousand-pound-plus ungulates – from afar and lie in wait, letting their dinner come to them. When the animal approaches, the cougar will spring, kill it with a swift bite to the back of the neck, and feed on the spot or take some back to its den with which to feed cubs. They concentrate mainly of deers, but they’re opportunistic hunters – they’ll eat anything they can get. As mentioned in the introduction, this does theoretically involve humans. This is remarkably rare, however – if it happens at all, cases are few and far between. There are many more easily available and less risky animals on which a cougar may predate, and by and large their preferred thing to do with human beings is avoid them as much as possible. Once a cougar reaches approximately two-three years of age, they’re capable of reproduction. Mating is swift and often violent, and the mother then sees the father out of her territory before retreating to a secluded den. Somewhere between three and six cubs are born approximately a hundred days later, and after three months they’re sufficiently weaned to begin hunting alongside their mother. After six they hunt alone, and after anything from one year to twenty-four months they will set out into the world to establish their own territories and find their own mates. Even a cougar’s cubs are more vicious than the cubs and kittens of many other cats – they’re untameable from birth, and all attempts to befriend a cougar cub appear to have failed. Cougars are animals of the wild in a way that is unusually determined, and they don’t appear to be domesticatable to any extent.